Sergey Kultaev (born 1980) started fencing at the school, “Riposte,” in 2003, after graduating from Saint-Petersburg State University. “Riposte” was the only place in Russia where students could study classical fencing. The tradition came to the Russian capitol with professor Joach Sieverbrück, who was invited by the ruling family to educate cadets in the noble art of fencing. The professor created the academy with the purpose of training fencing instructors. According to school history, the line of fencing instructors is direct, from the professor to Sergey Kultaev’s teacher Nikolay Chugunov (Master of Sport in epee in the USSR) who was not only a sport fencer, but also a historical fencing enthusiast. Sergey then started achieving his dream – learning elegant weapon martial arts traditions. Using his background in martial arts (kick-boxing), Sergey rapidly rose from beginner to local champion and, after just four years, became a fencing instructor. This has been his main professional activity for the past twelve years. Working as an instructor at “Riposte” (what became eventually known as the ‘International Academy of Fencing Arts’) Sergey started to travel around the world, studying different living martial traditions as Bartitsu, the Polish Cross-Cutting school, Matrak and so on. He is one of a small number of practitioners certified by the Sieniawski’s in Cross-Cutting technique, having achieved the level of instructor. Meanwhile, he had his own interests in fencing – the longsword in the tradition of Johannes Liechtenauer and the Renaissance rapier based on the Italian masters. So, in 2008, he started to collect sources and interpret them into a working technique. After two years of studying an English translation of Ringeck in 2010, he started a longsword class at the Academy, based on his understanding of the tradition of Lichtenauer through the prism of his experience in fencing and close fighting martial arts. However, the study of ‘heavy’ weapons wasn’t supported by the Academy director. Strongly disagreeing with this position Sergey left the Academy and founded his own club, the ‘FreiFechterGuilde,’ dedicated to the study of the fencing arts of the Medieval and Renaissance periods. This was the start of the HEMA movement in its international form in Saint-Petersburg and Russia, because at the same time a branch of the School of Saint-George appeared in Moscow. In 2014, that school organized the first longsword tournament in Russia – the Saint-George tournament. He has also been participating and winning in other competitions in various weapon forms, like rapier, small-sword (over six championships) and olympic fencing (epee). For four years he has prepared over a half-dozen champions and prize winners in longsword, rapier, military sabre and small-sword. While the FreiFechterGuild was developing in Saint-Petersburg, it’s number of active members grew to over fifty. The FFG hostes the annual FechtTerra (since 2014 it has been Russia’s top longsword competition) and the St. Petersburg Challenge (with colleagues from the ‘Tramazzone’ fencing school) events. Over 120 participants from 8 countries participated in the last “Challenge”. Members of FreiFechterGuilde support the largest Russian HEMA-resource the “Longsword Club,” and translate Ringeck’s and Meyer’s works to Russian. At the beginning of 2016, Sergey was unanimously elected as the president of the National Federation of HEMA in Russia. Sergey’s favorite saying is, “Got hit? It means you were wrong!”. He teaches only the techniques that he has interpreted, tested, and mastered himself in sparring and tournaments. Being a responsible instructor and champion, he is still being taught by Kirill Kandat (master of epee in the USSR, trainer of the Russian Olympic fencing epee team) and he visits every fencing workshop accessible to him. “Studying is an infinite process. My feeling is that this art is like a puzzle and we’re discovering parts of it from multiple sources from different ages”. 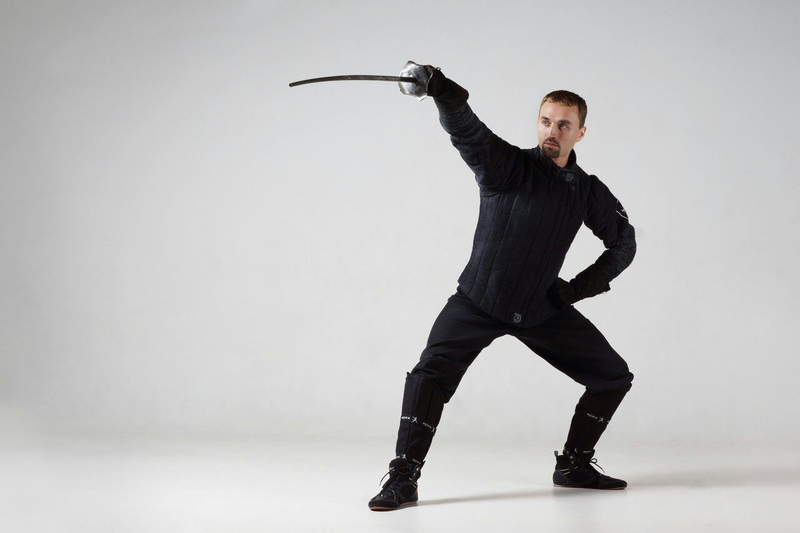 – The exact time, distance and combinations that lead to the proper execution of technique (Longsword). – The cross-cutting school of fencing (Polish heavy saber).